Optics and optical components covers all manner of devices that are used to manipulate or control light, and often are categorized under the term "Photonics". This category includes all products that are used to transmit, reflect, bend, split, diffuse or otherwise alter or refocus light wavelengths. This may include changing the spectrum of the light, transforming a light pattern into an electric one (image), or simply altering the direction or path. Items within the optics and optical components category generally include such items as Optical Filters, Optical Windows, Spherical & Cylindrical lenses, Aspheric & Ball Lenses, Prisms, Mirrors, Beamsplitters, Diffusers and Reticles. These components either use physical or electrical means to manipulate light, and have application as stand alone components, or are part of a larger optical system such as a laser, light source, diode, photomultiplier and optoelectronic sensor. Magnesium Fluoride: MgF2 exhibits high transmission properties from ~ 110nm Vacuum UV (VUV) to ~ 6.0um in the Infrared. MgF2 is a relatively hard crystalline material resistant to mechanical and thermal shock. MgF2 is a birefringent crystal typically oriented along the optical axis to avoid birefringent effects in windows & lenses. Calcium Fluoride: CaF2 exhibits good transmission properties from ~ 140nm Vacuum UV (VUV) to ~ 8.0um in the Infrared. CaF2 is a relatively soft crystalline material and care should be taken as CaF2 is sensitive to mechanical and thermal shock. CaF2 is a cubic single crystal optical material. UV Grade Fused Silica is a high purity synthetic form of silicon dioxide produced by a flame hydrolysis method from silicon tetrachloride. As a very high purity optical material it exhibits high transmission of light over an extended spectral range from the Deep UV (DUV) at ~170nm to 2.0 microns in the infrared. UV Grade Fused Silica has a very high homogeneity and extremely low bubble content with a low thermal expansion coefficient of 0.57 x 10-6/°C (0 to 200°C). 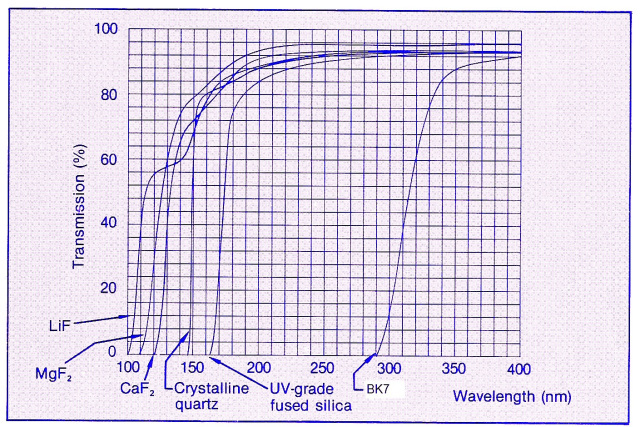 The index of refraction of UV Grade Fused Silica typically ranges from 1.5607 at 190nm to 1.4701 at 400nm to 1.4379 at 2.0 Microns. N-BK7 Glass is a excellent optical borosilicate crown glass material because it transmits light over a wide spectral range extending from the Visible at ~400nm to 2.0 microns in the infrared. N-BK7 Crown glass has a high homogeneity and low bubble content with a thermal expansion coefficient of 8.3 x 10-6/°C (30 to 300°C). The index of refraction of N-BK7 typically ranges from 1.5308 at 400nm to 1.4943 at 2.0 Microns. Other materials commonly used for optical components are based on the application in a particular area of the spectrum; usually requiring extended transmission in the Ultraviolet or Far Infrared wavelengths, and/or specific refractive index requirements. Some of these optical materials include crystalline materials such as Lithium Fluoride (LiF), Magnesium Fluoride (MgF2) and Calcium Fluoride (CaF2) for transmission in the Vacuum Ultraviolet (VUV) from ~120nm through Far IR up to 10.0 microns. CaF2 has a transmission band extending from ~140nm through 8.0 microns, and MgF2 has a transmission band extending from ~120nm through 6.0 microns. For DUV to IR applications high purity Sapphire has a useful transmission range extending from ~180nm to 5.5 microns. For IR applications only materials such as Germanium with a transmission range in the infrared from 2.0 to 4.0 microns, and Zinc Selenide with a wide transmission range from ~690nm to 18.0 microns are typically utilized. eSource Optics can provide optics manufactured from these and other materials on a custom basis. More information on eSource Optics standard Optical Materials can be found on our VUV-UV Materials Properties page. 10 / 5 indicates the average length of a scratch is .10 mm and the average diameter of the digs to be .05 mm. 40 / 20 indicates the average length of a scratch is .40 mm and the average diameter of the digs to be .20 mm. 60 / 40 indicates the average length of a scratch is .60 mm and the average diameter of the digs to be .40 mm. 80 / 50 indicates the average length of a scratch is .80 mm and the average diameter of the digs to be .50 mm. Surface Figure (or flatness for Plano surfaces) specifications for optical components are typically defined by a measurement of how accurate an optical surface conforms to its intended shape. Surface Figure is usually measured with a laser interferometer or reference test plate by forming an interference pattern through variance of the optical path length across the surface. Surface Figure specifications are usually presented in fractions of a wavelength, typically at the helium/neon laser line of 632.8 nm. These include l/8, l/10 and l/20, usually defining Laser Quality Optics. l/2 and l/4 usually defining Analytical Quality Optics; with 1l to 2l or greater typically used to define Commercial Quality optics. Optical bandpass filters are designed to transmit a well defined band of light at specific wavelength(s), and to reject all other unwanted wavelengths of light. They are formed by vacuum deposition of many thin layers of both all dielectric & metallic-dielectric-metal (MDM) thin film materials. The filter design is essentially a thin film Fabry-Perot interferometer consisting of two high reflecting stacks of alternating high and low index materials separated by an even order spacer film layer. These film structures are known as cavities, and many filters contain one up to eight cavities depending on the filters transmitted bandwidth and out of band rejection, or blocking requirements. By varying the film thickness of the spacer layer and or number of reflecting stacks, the filter can be designed to alter the transmitted central wavelength (CWL) and bandwidth of the resulting Optical Bandpass Filter. The resulting filter film produces constructive and destructive interference of the transmitted light. This type of filter exhibits a high transmitted passband of light but has a limited spectral range of rejection of unwanted wavelengths. To correct for this, an additional blocking film component is typically used. The blocking film is either a metallic-dielectric or an all dielectric thin film depending on the out of band blocking required. The resulting Optical bandpass filter is designed to transmit only a specific wavelength range, usually defined by CWL and bandwidth or Full Width at Half Maximum (FWHM), and eliminate all unwanted out of band radiation. Additionally, the filters wavelength range limitations are usually dependant upon the composition of the thin-film filter coating and substrate materials. Optical bandpass filters can be designed to transmit Vacuum Ultraviolet (VUV) below the absorption of air at 200nm, for use in the 120nm to 190nm wavelength range; and Deep Ultraviolet to Ultraviolet (DUV - UV), for use in the 200nm to 320 nm wavelength range. VUV to UV Optical filters are typically multi-cavity MDM thin films deposited onto one or more UV grade fused silica, Quartz or Fluoride Crystal flat substrates. Longer wavelength Visible filters for use in the 380 nm to 750 nm wavelength range to Near Infrared (NIR) wavelengths from 750 nm to 2500 nm to Infrared (IR) wavelengths tuned to the >2500 nm wavelength range can also be produced. Note: eSource Optics specializes in suppling VUV-UV Optical Bandpass Filters in both Narrowband and Broadband FWHM designs. Optical Windows are flat polished round transparent windows typically used to isolate environments while allowing light to pass relatively unimpeded. Optical Windows are generally used for view ports or sealing and or protecting other components within an optical assembly, instrument or laser. Plano windows are typically parallel and are designed to have the incident light enter perpendicular to the windows surface. Window types available from eSource Optics are Plano (or flat) round diameter or square windows; rectangular windows are also available on a custom basis. Important dimensions to consider include the diameter if a round window, side if a square window, and length and width if a rectangular window. The window thickness is also important to consider; especially in a chamber or pressure application. Parallelism or wedge angle of a window is also an important specification to consider. This is typically specified in arc minutes for either wedged or very parallel windows. A problem with very parallel windows is that the second surface reflection can lead to unwanted system back reflections. However, reflections from the surface of a wedged window are not parallel and also slightly separated. A typical type of wedged window is called a Brewster window. Brewster windows are used in optical systems at Brewster's Angle of ~ 56°; the angle at which 'P' polarized light suffers no reflection loss. Brewster windows are typically available from eSource Optics on a custom basis. Note: eSource Optics specializes in suppling VUV-UV Optical Windows & Wedged Windows in VUV-UV Optical Materials MgF2, CaF2, Sapphire & UV Grade Fused Silica. Spherical Lenses are transparent optical components with one or more surfaces formed like a sphere. Spherical Lens surfaces are curved to converge or diverge the transmitted rays from an object, thus forming a real or virtual image of that object. There are two main Spherical Lens shapes that determine the imaging characteristics of the lens. Plano-Convex Spherical Lenses have one flat (Plano) surface and one spherical surface curved outward (convex) to converge the transmitted rays from an object. A Plano-Convex Spherical Lens is used as a simple imaging lens to focus, collect and collimate light. Plano-Convex Spherical lenses have positive Effective Focal Lengths. Plano-Concave Spherical Lenses have one flat (Plano) surface and one spherical surface curved inward (concave) to diverge the transmitted rays from an object. Plano-Concave Spherical Lenses are typically used to diverge collimated incident light. Often used to expand light or increase focal lengths in an optical system. Plano-Concave Spherical lenses have negative Effective Focal Lengths. There is also other Spherical Lens forms, or shapes, that determine the imaging characteristics of the lens. These are Bi-Convex, Bi-Concave, Meniscus, Aspheric, and Ball type lenses. Bi-convex lenses have a positive focal length and are useful for 1:1 imaging and in multi-element systems. Also known as convex-convex or equiconvex. Bi-Concave lenses have negative focal length, and are used for image reduction and to spread light. Also known as concave-concave or equiconcave. Meniscus Lenses can increase the numerical aperture of a positive lens assembly, without an undue increase in the aberrations. Aspheric Lenses compensate for spherical aberration and are used primarily for their light gathering ability. Ball Lenses are used to provide short focal lengths for use with collimated light. They are often used in fiber coupling applications. All of these spherical lens types are typically available from eSource Optics on a custom basis. Note: eSource Optics specializes in suppling VUV-UV Spherical Lenses in VUV-UV Optical Materials MgF2, CaF2 & UV Grade Fused Silica. Cylindrical Lenses have one or more surfaces formed like a portion of a cylinder. A Plano-Convex cylindrical Lens will focus light in only one dimension. Cylinder lenses can transform a point of light into a line image. Cylinder lenses magnify in one dimension and can be used for stretching images. Cylindrical Lenses can be used to correct astigmatism in the eye, and, in Laser rangefinders, to produce astigmatism, stretching a point of light into a line. Most glass type cylindrical lenses can have antireflective coatings applied to the surfaces to increase the transmission of light through the lens. eSource Optics Cylindrical Lenses are available in either plano-concave or plano-convex configurations. Plano-convex lenses have a positive focal length, which makes them ideal for collecting and focusing light for many imaging applications. Plano-concave lenses have a negative focal length and are used for image reduction or to spread light. Color Glass filters include a wide range of filter types that are distinguished by their specific color spectrums and wavelengths, as well as their absorptive glass characteristics. Color filter glass, is distinguished by more or less selective transmission and absorption of certain wavelengths, depending upon the color and physical thickness of the glass. Many different types of Color Glass Filters are available such as band pass, short wave pass, long wave pass, ultraviolet, infrared, heat absorbing, and color temperature conversion filters. Absorptive Neutral Density Glass Filters are typically available with Optical Densities (O.D.) ranging from 0.10 to 4.00. Rather than transmit a specific color band or bands of light, Absorptive Neutral Density Glass Filters Attenuate incidence light by absorption within the glass substrate. These Filters are used in applications such as calibration filters, where minimal reflection of incident light is required. One of the most popular and widely used types of Color Filter Glasses is manufactured by Schott. These filter glasses are identified by their selective transmission and absorption of certain wavelength ranges of light and associated color. Each of these ranges is specified by a two-letter prefix code, which are as follows: UG, BG, VG, GG, OG, RG, NG, WG, KG, and FG. These codes are followed by a numeric designation, which further specifies the transmitted color and absorption type. Further important specifications for color filters, which are not designated by code, include shape (diameter (round), rectangular, or square); and its thickness. Optical Prisms are blocks of optical material with flat polished sides arranged at precisely controlled angles to each other. Prisms may be used in an optical system to deflect or deviate a beam of light. They can invert or rotate an image, disperse light into its component wavelengths, and be used to separate states of polarization. Prism types available from eSource Optics are Right Angle Prisms and Equilateral Prisms. Right Angle Prisms are a type of 45-90-45 degree prism typically used to bend a beam of light through a right angle with the surfaces forming the 90-degree angle acting as the transmitting faces. This is the most common type of prism for many applications. Equilateral Prisms are a dispersing type of prism typically used for wavelength separation applications. The three sides of the prism are of equal length. A light ray is twice refracted passing through the prism with total deviation a function of prism material index of refraction, and hence wavelength. Other Prism types include Dove, Isosceles Brewster, Pellin Broca Prisms and are available on a custom basis. Also see eSource Optics "Glossary of Terms".